I’ve a few thoughts on these stirring around in my head, but I haven’t posted anything yet because I’m letting them stew a bit longer. A while back I asked on this here page whether or not I was becoming a Quaker. I like Quakers, you see, and find them to be a most agreeable sort of Christian to know. Only I’m not sharing the politics that seem prevalent among them. These cause me to pop in and pop out of various conversations, as I want to discuss, but find my political disagreements to be disagreeable, mostly to me, and maybe to them. Peace, you see, should be something more than something proclaimed. It needs to be within. At least that’s my thinking on the subject, and politics makes me, well, a wee bit fractious. But, there are important things at stake in political discussions, and I wish my affinity would match my agreeableness. Instead, what I’m coming to notice is that I share a examinative quality, rather than a result quality. I really do wrestle with these same issues, and really do want to come to terms with a response that is in unity with the whole of the Christian life. The funny thing is to come down in different ways with people who are trying to do the same things. Hands, feet, body of Christ and whatnot maybe. But, for now I’m still stewing, and my Quaker friends, my Friends friends, will enjoy the fact I got The Journal of George Fox in the mail today. However, it remains to be seen if this will help me be more agreeable, or give me more cause to be disagreeable. I’m a big fan of primary sources, partially because I find the primary sources to be a rather bit different than the modern day representations. This is true for Scripture and the Church, and all sorts of other derivative leaders and their movements. So, maybe I’ll become even more dissident. All in love and peace and unity of Spirit of course. I hope. 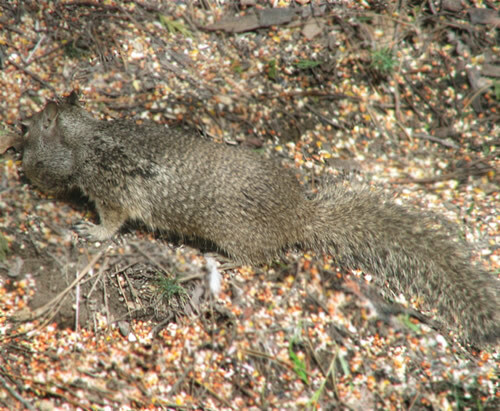 A California Ground Squirrel was around yesterday collecting a bit of seed. First time I’ve seen one for about four or five months. Clearly, he’s a bit hungry, and the larder back home needs to be refilled. Uncategorized Comments Off on Whither my emergent chat? Discontent is a curious thing. Generally it’s considered bad form and whatnot, unless you’re a person in power, but then it isn’t discontent, it’s leadership. Those in power have their discontent redefined as a movement, or a method, or a style, or a revolution, or a paradigmatic, missional shift. But, it’s discontent all the same, and people in power aren’t the only ones who feel it. The very best leaders, the only real leaders in my estimation, have a discernment about discontent, a sharp eye for what is holy discontent, spurred by the Spirit in the midst of the community, and unholy discontent spurred by a different spirit in the community. The former is prophetic, the latter is destructive. The harsh thing in Christian communities is there’s such an utter lack of discernment, especially among leadership. I realized that in reading through the latter two books assigned my own discontent was rising. Not at the authors, not at their communities, or methods, but at my own ministry experience and my own ministry past dealing with leaders who had positions of leadership but never did lead. What did they do? They took up space, and still do, thinking that leading involves telling people what to do and how to do it, or rather what not to do and how not to do it. That’s what hits my frustrations, for in the books I was reading I was not just reading about their ministries and their events. I was reading about my own passions, I was reading the thoughts of people I knew and worked with, and struggled with. I kept saying, “Yeah, we did that.” Or “Yeah, that we could have been there.” Only we didn’t because the hammer fell, a hammer of power, and control, and selfish ambition. So why did I not wander off to another field, skip out on the church of my youth and begin anew. Because of the other books I read in this course which lauded communities for their vision, and knowing for myself those communities, and many like them, folded and shut down, the vision momentary and passionate, rather more like a heated affair than a real commitment. The Emerging Church is a serial monogamist, always extremely committed to the commitment of the moment, but always drifting, drifting, drifting, so there’s a whole pile of sloughed off people, once passionate, now wandering in their own frustrated discontent. The promise is beautiful for the moment, but doesn’t last, because visions don’t last, because commitments don’t last, because leaders who style themselves new Pauls don’t last. The only problem is they do not have Paul’s ability to go where no one else has gone before. They stir the same pot, driving past each other, flying by each other, rebuilding on top of the smoldering ruins of the previous community. I stepped back because that’s what I saw, and didn’t see in myself anything different. I stepped back because of the studies that say well over half of those who go into ministry don’t last in ministry. If I am to last in ministry I had to step back and discover what it was that would push me past the discontented, polyamorous forms of ministry that thrive in publisher and Leadership based models. And in this is my own discontent, a holy form which pushes me to try and see, and I think I’ve seen something, something which peeks out in previous posts. But it’s not in those books assigned, or in conversations of style, and liturgy, and yet one more attempt at authenticity. It’s something deeper, and something I haven’t yet gotten my hands around, but I’m trying to. And in trying to do that I think it’s sometimes better for me to remain silent, if the only words which arise are those of discontent. That critical part of my own vision seems to push me to see something broader and helpful, but also can drive me into being judgmental or merely a plain bore. That’s not the side of me I want to invest in, and neither do I want to invest in words just for the sake of words. I enjoyed the class because of the face to face discussions, the wrestling together, the conversation, things which decidely seem to lack online, where my words seem only to serve to pad my own discontent. That’s not something I need. What I need is the Holy Spirit, and there are ways to go about finding the Spirit spoken of throughout history, and posting book reviews is not the way to go about doing it. So there you go. My prickliness emerged, and I didn’t like how it was looking. I step forward, and I step back. I look about, and I look around, seeing the landscape and in seeing that gauging also my own soul. Much progress had been made, but in this track, in this path I am on, it takes a while, for there is no apparent room for the slightest bit of dross. Every once in a while I realize I’ve lost my poetry — that subtle, transcendent quality of noticing and responding to the vagaries of this world. Instead of having that I get bogged down by reality, thinking it really is reality. At times I consider I merely need a muse to arise, to shine into my life, to inspire those deeper parts of my soul that get tired and bored without intersoul contact. But then I realize for the poetry to be real the muse may only be yet another object for the light to fall upon, a subject, may she be a beautiful subject, of study and research and pondering and purpose, but not the source for the poetry itself. So, when I realize these things I remember that to find the poetry at all I must find it in my lonely, lost, and tendentious self. Because, the fact is, when I can find it, everything else seems that much more filled with light, even those parts that have yet only had persistent darkness. I would not object if some critic said I wasn’t a poet at all. Indeed, trying to think of oneself as a poet is a peculiar business. What does it feel like to be a poet? I am always shy of calling myself a poet and I wonder much at those young men and sometimes those old men who boldy declare their poeticality. If you ask them what they are, they say: Poet. A man (I am thinking of myself) innocently dabbles in words and rhymes and finds that it is his life. Versing activity leads him away from the paths of conventional unhappiness. For reasons that I have never been able to explain, the making of verses has changed the course of one man’s destiny. I could have been as happily unhappy as the ordinary countryman in Ireland. I might have stayed at the same moral age all my life. Instead of that, poetry made me a sort of outcast. And I was abnormally normal. I do not believe in sacrifice and yet it seems I was sacrificed. I must avoid getting too serious. I occasionally make note here about some saint or another who did something wise, or holy, or devout, or such likes. The reality is these people lived and still live, we have famous names of the past who act like heroes for our own faith, and we have those in the present who still take a stand for the faith. I don’t have much to add on the topic, but I thought it is right and good to honor Abdul Rahman. Far too many Christians make such a stand in total anonymity, so in honoring Rahman, we also honor, and support, and pray for the others. 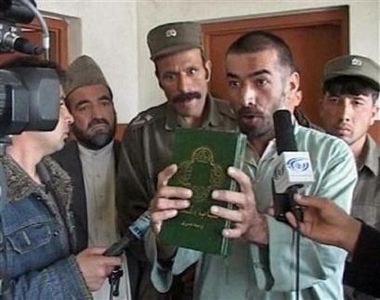 Rahman is that historic Afghani product, Lapis Lazuli — True Blue. He is a confessor, and may yet be a martyr, for his faith, for Christ, not for an ancillary doctrine. He is a model for us, for he may die for the faith, and that challenges us to live for it. Well, if you haven’t been able to tell by my last few posts, I’ve a new section up called Cawing. It’s where I’m going to start putting up stuff I’ve written which doesn’t already have a home elsewhere. If you have any comments or suggestions or thoughts or contemplations or musings or rants or anything else about anything you read please feel free to send them my way. A little while back I had the opportunity to write a little bit about worship for a good friend. Taking my bit of background in church history I wrote five narratives, each illustrating how a Christian in different times in history would understand and appreciate and value his worship experience. As part of my new cawing, I now present for your perusal Worship Through the Ages. Sometimes it’s a problem with the system. Sometimes it’s a problem with the instructions. Sometimes things just plain don’t work. Sometimes, you just get the wires crossed and don’t need to have one of the wires plugged together at all. My installation frustrations have to do with that latter bit. Like I said car stereo installation is not something they teach either in a traditional undergraduate liberal arts education, nor in seminary. Somethings in life, like automotive audio, you just have to learn by doing, and sometimes doing wrong. I’m actually happy it’s my fault, especially since I fixed it. This way I don’t have to go through the whole return process, and everything can be settled with it all today. I imagine there’s a nice theological lesson in all of this. But, I’m not going to work one out. Feel free to contribute your own. politics Comments Off on Security? For Eternity? For whatever reason I finally feel like posting this, something I finished earlier this week. It was for a student project, not for me, but for another student who was gathering together a collection of essays on the topic of Eternal Security, gathering together from a variety of resources, I seeming to be the least officially educated of the lot. So, here’s my consideration of Eternal Security, whether we are saved for all time or not, as it touches on Colossians 2:13-15. To be honest, prior to this I was leaning against eternal security, as I always regarded the Hebrews verse with some weight, and thought that our moral choices did have an impact, maybe even to a certain point a crucial impact. The position for the project was to support the idea of Eternal Security, so that I did, and in doing this I think I may have pushed myself to the other side of the fence. Interesting. I enjoy it when that happens. Though, I think a more substantial treatment might pull me back a slight bit, as I think there might be one road out of heaven, but just the one, and that is not unintentionally taken. Or maybe it just goes to show that I can succesfully argue even myself into a position because that was the assigned position. That old potential lawyer in me coming out again, I guess. So here it is, my bit of semi-exegesis for the week. And you know what? It’s not about us. You might also note the new section. It’s just this wee bit now, but it will grow over the next few weeks. I realized I have a lot of writing in a sort of computer limbo, not doing anything worthwhile. So, if I’m not going to send it out to be published, I might as well post it here, in whatever state, on whatever topic it finds itself. Someday soon I might also get back to that topic of Emerging Church stuff that seemed to so entirely disappear from the dualravens.com radar.